London: Oxford University Press, 1913. A very solid copy of the 1913 1st edition of H.J.R. Murray's sweeping history of the greatest board game of all. Tight and VG+ in its navy-blue cloth, with crisp, unrubbed gilt-design and titling along the frpnt panel and spine respectively. Offsetting to the endpapers, handsome bookplate at the front pastedown, otherwise clean as could be internally, with no writing or markings of any kind to the text. Thick quarto, top-edge gilt, 900 pgs. all told. A scholarly, early attempt to get a handle on the extraordinarily rich histoy of the game, from its vague Indian ancestry of the 5th-6th centuries A.D. up thru the book's publication at the beginning of the 20th century. 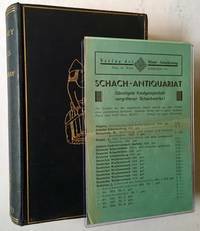 This copy also includes an uncommon piece of chess ephemera, an issue of a 1924 Viennese chess newspaper advertising the sale of recently out-of-print chess titles. The fragile single sheet is light blue-green, is printed on both sides and is now housed in archival plastic. Oxford at the Clarendon Press, 1913. First edition, first impression. Lacking the dust jacket. Spine re-backed in matching blue cloth, keeping the original cloth spine, which is lettered in gilt. Front board a little bowed. A few small stains to upper edge of text block, with light foxing to front paste down and endpaper. Clean through in a tight and square binding. A very good copy overall. . First Edition. Hard Cover. Very Good. Oxford: Clarendon Press. Good+ with no dust jacket. 1913. First Edition; First Printing. Hardcover. Covers show stress lines to external hinges. Spine slightly sun toned though gilt remains bright. Corners worn with boards showing. Binding is sound though weak between frontis and title pages. Spotted foxing at endpages with a name penned to front pastedown. Text is lightly toned at edges but otherwise clean. ; Small 4to 9" - 11" tall; 900 pages . Oxford, Clarendon Press, 1913.. FIRST EDITION, first issue 1913, EX LIBRARY COPY. Tall thick 8vo, approximately 265 x 160 mm, 10 x 6¼ inches, frontispiece and 18 full page illustrations, 147 illustrations in the text, 900 pages including index, in original publisher's dark blue cloth, gilt lettering to spine, gilt Isle of Lewis chess knight and gilt ruled border to upper cover, gilt rules and lettering to spine, top edge gilt, other edges untrimmed. Upper hinge slightly cracked at head and tail, now reglued and the same to head of lower hinge (see images), gilt library number to spine, pale blind library stamp to top corner of title page, final page and page 25, not affecting text, small pale pink library stamp to the blank side of all plates, evidence of label removal from first pastedown, slight wear to head and tail of spine and corners, age-browning to pastedowns and endpapers, small neat repair to 1 lower margin, nowhere near text, some pages have light turning crease, occasional small nick to margins, a good copy only, binding tight and firm, no loose pages. Only the first issue of this book has the gilt vignette to the upper cover and gilt top edge as our copy. A comprehensive history of the game world-wide, Part I: Chess in Asia, Part II: Chess in Europe. Chapters include: Chess in India (3 chapters); Chess in the Malay Lands; Chess in China, Corea, and Japan; Chess in Persia and the Arabic and Persian Literature of Chess; Chess under Islam; The Invention of Chess in Muslim Legend; The Game of Shatranj: Its Theory and Practice; Chess in the Middle Ages; The Early Didactic Literature; The Mediaeval Problem (3 chapters); Chessboards and Chessmen; The Beginnings of Modern Chess; From Greco to Stamma; Philidor and the Modenese Masters (this chapter includes the automaton chess-player). Heavy book which will require more postage costs, email us for quote. MORE IMAGES ATTACHED TO THIS LISTING, ALL ZOOMABLE, FURTHER IMAGES ON REQUEST. POSTAGE AT COST. Skyhorse Publishing. PAPERBACK. 163220293X Like New Condition. . Fine. Skyhorse Publishing. PAPERBACK. 163220293X New Condition. . New. 2015-07-07. Good. Ships with Tracking Number! INTERNATIONAL WORLDWIDE Shipping available. May not contain Access Codes or Supplements. May be ex-library. Shipping & Handling by region. Buy with confidence, excellent customer service! 2012-02-06. Good. Ships with Tracking Number! INTERNATIONAL WORLDWIDE Shipping available. May not contain Access Codes or Supplements. May be ex-library. Shipping & Handling by region. Buy with confidence, excellent customer service! Skyhorse Publishing, 2012-11-01. Paperback. Used:Good. Skyhorse Publishing, 2012-11-01. 1. Paperback. Good. Oxford: Oxford University Press . Hardcover. Black cloth in red dust jacket. Oxbow Books edition (later reprint of 1913 edition). Ownership inscription on front free endpaper and owner's blind stamp on title-page. Otherwise, clean and sound. Like New. ISBN: 0198274033 . LikeNew. Hardcover . Oxford at the Clarendon Press. Collectible - Good. Octavo. Hardcover Cloth. 1962. Ex-Library with the usual treatments. Text in English 900 pp. Bound in original. Bound in original blue publisher's cloth. Cover has mild bumps and rubs along extremities. Interior text and plates are clean throughout. Binduign solid. Offered by the Antiquarian, Rare, and Collectible department of Better World Books. Your purchase benefits global literacy programs. 100% satisfaction guaranteed.